Atlantic General Hospital, a not-for-profit hospital opened in 1993, is located on Maryland's Eastern Shore in Berlin. This Delmarva hospital serves residents of Worcester, Wicomico, Somerset, Sussex (Delaware), and Accomack (Virginia) Counties. This hospital has grown quickly. It started as a 62-bed facility, treating just over 13,000 emergency room visits in the first year. Today, the hospital treats more than 117,000 visits per year and employs a staff of more than 850, with 227 of those employees being medical staff. The hospital expects to continue to grow. Atlantic General Hospital complete $35 million in capital projects planned under a five-year strategic plan. The emergency room at Atlantic General was expanded in 2003, to include 19 beds with eight cardiac beds. 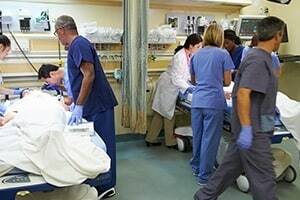 The ER treats about 27,000 patients each year. The hospital also makes a "30-minute ER promise." This promises patients that they will either begin to receive treatment or that they will be placed in an ER bed within 30 minutes of their arrival to the hospital. Atlantic General has an accredited Bariatric Center. In 2016, the hospital's Imaging Center was named a Screening Center of Excellence by the Lung Cancer Alliance, recognizing its ongoing commitment to lung cancer screening. The hospital's Vascular Laboratory is also accredited in extracranial cerebrovascular testing, peripheral arterial testing, and peripheral venous testing. Atlantic General's Wound Care Center has an exceptional statistic - they are currently capable of healing over 96% of wounds treated, which exceeds the national benchmark and earns them several awards. Atlantic General Hospital has received many awards and recognition. Most recently in 2016, the hospital received the Circle of Honor Award for Patient Safety Innovation for the third year in a row. Also in 2016, Atlantic General Hospital was among the 6% of hospitals in the nation that received the Most Wired Hospital Distinction by the American Hospital Association, which looks at how organizations use information technology to improve the delivery of their healthcare. In 2014, they received the American College of Radiology Lung Cancer Screening Center and Ultrasound Accreditation. In 2011, 2013, and 2014, the hospital earned a gold plus quality achievement award in regards to Stroke Quality Awards, which requires a minimum of 85% adherence to the guidelines for two 12-month periods. In addition to the main hospital, Atlantic General has a Health System with 15 locations with family physicians and specialist throughout the region. Atlantic General has recently been defended by attorneys at Goodell, Devries, Leech & Dann. They have also been defended by Booth, Booth, Cropper,&Marriner, P.C as well as by Michele Smith at Adelman, Sheff and Smith LLC. We have been unable to find any verdicts and settlements against Atlantic General Hospital. But there sure are a lot of lawsuits for a hospital of this size. Below is a list of cases recently filed against Atlantic General, and a summary of the allegations when available. If you or someone you love was improperly treated at Atlantic General or another hospital, contact Miller and Zois at 800-553-8082 or go online for a free case consultation. We have a long history of substantial verdicts and settlements in hospital malpractice cases in Maryland and we have handled many cases on the Eastern Shore. The Penguin Swim to raise money for Atlantic General Hospital is a big event every year. Learn about bringing malpractice claims in Worcester County.